Why are over 50,000 people mysteriously attracted every April to a Military Academy in a remote sleepy village? What sport in Sri Lanka attracts the biggest crowds ? Many might give cricket as the reply, as it is the most popular sport in the country. But cricket is NOT the sport that attracts the most number of spectators to one venue. It is Motor Sports ! 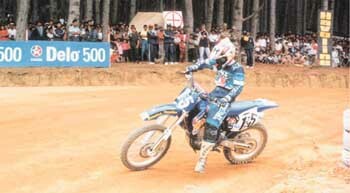 The venue which attracts the largest number is where the annual Fox Hill Super Cross is held inside the premises of the Sri Lanka Military Academy in Diyatalawa. Over 50,000 people from all walks of life and all parts of the island thronged the famed Fox Hill last week to watch the exploits of Sri Lanka's best racing drivers and riders. "The atmosphere is fantastic. You get pumped up automatically when you see an audience like this. Drivers are motivated to perform at their peak level" was how former champion racing driver Mahes Gammampila described the feeling on track. From early morning last Sunday, all roads of the area were leading to Fox Hill as undoubtedly the most busy day arrived on the otherwise peaceful holiday setting of the cool climes. People poured in from all directions while the vehicles were fast filling the massive parking spaces. "This is the best entertainment for most of the people of these areas. Even people from areas like Hambantota, Wellawaya, Badulla, Moneragala, Pelmadulla, Ratnapura come to see the races. It is a fairly short journey for them because they are starved of real entertainment", Major Dilhan Jayawardena, one of the chief organisers of the event told "Sunday Times". Finally, when the riders came under starter's orders for the first time that day, over 50,000 people were waiting to catch the action. Main part of the colossal organising structure is handled by the officers and cadets of the Academy who turn an impossibility into a reality. The track was just the ideal for the country's most popular racing event. "We are making constant changes to the track to see that it caters to the competitors at the optimum level. This year, we widened a particular bend to allow more sliding room as there were many accidents at the spot on earlier years. We also smoothened some rough phases on the course. All the time races are improving" said Gammampila, who is now a key official of the Sri Lanka Racing Driving and Riders Association (SLARDAR) which handles the supervision and part of organising of the meet. One key element which makes the course so attractive is the visibility of all parts of the track from one point despite the vastness of it all. It is a fantastic sight when the cars and motorcyclists zoom past the massive clusters of people to a roar of approval and clapping. One would think that Fox Hill, being the most successful event, has an unparalleled tradition. But surprisingly it is just six years old ! Major Jayawardena is someone who has seen the evolution of the races since the beginning and is one of the happiest men around. He put the income figures of the meet around Rs. 1.5 million which entirely would go for the Academy's welfare. Today, he knows that the meet has exceeded all expectations that they had, when it was mooted. Foremost motor racing sponsor in the country, Caltex has pumped in a huge package for the meet which helped the organisers a long way. Though Caltex doesn't want to reveal the exact figure it is a seven figure amount which has set a Sri Lanka record for a single event sponsorship. "We were not just looking at the mileage. In fact you can't expect to get something in proportion to what we have put. But we know that the money is going to the Academy and to the Army which is fighting for the country" described Shibly Latif, Group Brand manager of Caltex. Fox Hill is the brain child of Hans Ralf. Ralf together with Brigadier Gamini Goonesekara (now General) made the blueprint for the Sri Lankan history's most successful sporting event ever, though they never thought it would reach the magnitude it is held today. Then Brigadier Goonesekara was the Commandant of the Diyatalawa Academy and Ralf was the President of the SLARDAR. Ralf was holidaying in the Academy when he spotted the track and suggested that it could be developed into a competition track saying that there were many such tracks in his native country Germany. Today he is called "The Father of Fox Hill." The races were first held in 1993 and people who handled the bulk of organising were Academy's Chagi Gallage, Nalaka and Jayawardena. Gammampila who was also a former SLARDAR President said "We never thought it was going to be a success like this. In fact nobody thought." But the day of the inaugural races there was a stupendous attendance figure of over 25,000 and the rest is history. "Ever since numbers only increased" Gammampila said. The main objectives of the races were to enhance the image of the Academy and create funds for the welfare of the Academy. The official dinner after the event at the Officer's mess of the Academy is also a feature of the event and this year's races as well as the dinner was attended by the Commander of the Army Lieutenant General Sri Lal Weerasooriya. On the track, the conspicuous hero was the effervescent Ananda Wedisinghe who captured the imagination of the massive crowd with his unmatched powerful rides on the bike coupled with on field antics. Wedisinghe has created something of a legend for himself at Fox Hill having won the key events for bikes since the very beginning in 1993. He showed amazing control on his powerful 400 cc bike through the bumpy course and was simply superior to all others without doubt. He captured all four events he competed with ease, and the only one looked capable of challenging his supremacy seemed the young schoolboy Rakhitha Wijetunge. However on the day, Wedisinghe was just too good for Wijetunge and all others. His victories were all by big margins to indicate his prowess. The young man of just 26 years sprayed champagne all over everyone at the awards ceremony to bring some light hearted fun to the formal event, heavily guarded by the Army Commandos. Wedisinghe who conducts his motor vehicle sales from Japan through the firm "Auto Plaza Ananda International" donated a large touring bus to the Academy at the ceremony and also pledged to donate ten brand new motor cycles to the Academy. His younger brothers Udesh and Sajith also won events and the three brothers together made a clean sweep of all eight motor cycle events except the upto 80 cc event. Defending Open cars champion Pradeep Jayawardena had to withdraw from the Group T&M Cars Over 2665 cc event when he developed trouble in the car's computer. Jayawardena in his black Subaru Impreza got off to a superb start and led the race for two rounds before withdrawing while Aravinda Premadasa gladly took over to win the race. Then in the Open event, Premadasa, in the absence of Jayawardena, led from start to finish after seeing his nearest rival Dinesh Deheragoda give up the race three rounds into the race when his Mitsubishi Evolution went up in flames. Rizvi Farouk gave a stunning performance on his Honda V Tec and challenged Premadasa to the hilt in the closing stages and emerged second while Rohith de Silva was third. England will be the venue of yet another great and historic cricketing event, where the 7th World Cup competition would be staged. This is the fourth occasion where England would be the host country since the first World Cup Tournament was held in 1975. 0n that occasion it was sponsored by the Prudential Assurance Company and was called the Prudential World Cup. Twelve teams including all Test-playing nations would be vying for supremacy and honours. The stage has been set for a very exciting and thrilling series and the cricketing world ensured a feast of bright cricket and hair raising finishes are on the cards. One would agree that retaining a title is far more difficult than regaining a lost one. Hence the champions would have to be at their brilliant best despite the fact that they would be entering the fray as underdogs being an ailing side at the moment of time. Ever since winning this prestigious trophy it has been a question of fluctuating fortunes for the Lankans. Their supremacy and invincibility put to the test and dented in several contests. However, it should also be borne in mind that ups and downs are part and parcel of this type of game. Also the odds weigh heavily against the Lankans. It is left to be seen how far they would rally round showing glimpses of their old form and come back strongly with vengeance to hold on to their title. For this the Lankans must regroup and get all their acts together so that they may be able to make it to the knock-out round and thereafter launch an all-out offensive from that point onwards in order to achieve their objective. Nothing is impossible in this game of uncertainties. Lankan cricket is definitely not in the dumps or doldrums but going through what may be termed an agonizing period or phase of transition. Whether it would be for the better or worse is left to be seen and only time would decide the final outcome. Let us all hope for the best. The selectors have virtually banked on the same players who represented the country in the last World Cup with just two or three new faces and a few omissions from the earlier squad. This indeed is a wise move and the best they could have done under the present circumstances, where cricket in Sri Lanka is concerned. However, it is also a matter of opinion whether anyone among the new faces justifies selection or anyone else who deserved to be included in the squad was left out. It must be admitted that there prevails a most disgusting and unsettled state of affairs where cricket at all levels in Sri Lanka is concerned, much to the confusion of lovers of the game at home and overseas. The talent and experience of the senior players would certainly strengthen the side many of whom are quality allrounders. It may be mentioned that this may sometimes be the last opportunity for some of these senior players to represent the country. Most of them are very likely to hang up their boots and call it a day at the end of this series considering their physical fitness and the obvious age factor. Everything said and done, the Lankans cannot be taken for granted, underrated or written off being one-time incredible supermen of instant cricket. All teams in the fray are very conscious of this fact, for the Lankans are fighters. Sri Lanka whose cricket had brought glory to the country had not kept the world waiting too long with their swashbuckling and dynamic approach, although it must be remembered that the world kept them out for quite some time. For the Lankans there is no time to look back and ponder. The lessons learnt and experiences gained from tours at home and abroad since being tagged the World Champions must be exploited to the fullest. This is a golden opportunity to display this. The Lankans should also keep in mind that this series is going to be the most competitive, decisive and a very scientific one. Factors such as run targets, physical fitness, fielding skills, aggressive and top class batting, field placing, run saving, quick wicket taking, brilliant catching and pressure placed on the opponents are factors of vital importance in winning one day games, no matter what the conditions are. It should also be overemphasized that Sri Lanka should always be on the offensive and revert back to their aggressive type of play, which had paid off handsomely in the past. Sri Lankans should give up the myth of fielding first after winning the toss and chasing a target. Of course there may be exceptions to this decision according to the prevailing conditions. There is obvious talent in all our players and it is hard to believe that we will go through yet another phase of dismal, disappointing performances and humiliating defeats which may very well mean the end of the road for Sri Lankan cricket. It is best we play to a carefully studied game plan by changing strategies to match the mode of play of the opponents closely monitoring the danger men in the opposite camp. This should pay rich dividends. This is exactly what the South Africans have been doing and mastered this to their advantage. Going on present statistics of one-day games in the international arena the South Africans seem to be the hot favourites and have the best chance of winning the World Cup. They would certainly face stiff opposition from Pakistan, India and Australia. An upset cannot be ruled out and could very well be expected from either New Zealand or Zimbabwe. Both teams are vastly improved sides who play very positive cricket. The moral of the Sri Lankan team should at all times remain very high with team spirit the key word, but it appears that this is lacking at this moment which is a vital drawback and crucial to the players. J.G. Read's prolific handicap chaser Young Kenny captured his third long distance race Saturday last as he virtually ran away with the Scottish Grand National Steeplechase run over a gruelling 4 miles and 1 furlong over 27 fences of the northern Ayrshire course. Side-stepping the Grand National proper at Aintree a week ago Young Kenny whom I tipped for the blockbuster took up the running three furlongs from home and cruised away by 9 lengths with Hollybank Buck second and Full of Outs further 6 lengths away third. And what a treat it was to watch the 8 year old chaser negotiating the fences in immaculate style. B. Powell who rode the 5/2 favourite for trainer P. Beaumont was all smiles as he came round to the unsaddling enclosure. Powell is one of the best in the business of jump racing. P. Nicholls's NORSKI LAD should keep on winning over handicap hurdles. Miss V. Williams' JOCKS CROSS 3rd to Mike Stan at Ayr on 17/4 should do well when returning to 20 furlongs. Martin Pipe's POTENTATE who nibbled a few flights in the Scottish Champion Hurdle at Ayr on 17/4 won by Fadalko should find a consolatory race in the near future over 16 furlongs. As Young Kenny, winner of the Scottish Grand National, is sure to lay off now that he has earned nearly £ 200,000 for his lucky owner, the horse who came in as runner-up Hollybank Buck should be followed for an early win - may be in a week or two also over along distance of 25 furlongs. P.Nicholls's GREEN GREEN DESERT who beat Blazing Dawn by 7 lengths at Ayr on 17/4 should continue the good work. Dave Nicholson's Shotgun Willy 3rd to Ballinclay King at Ayr on 17/4 in an Open Flat race over 16 furlongs is a sure winner next time out also in an Open Flat race - Follow him. P. Nicholls's BENGERS MOOR after two unsuccessful attempts, being pulled up both times latest at Chepstow behind In The Blood finally delivered.